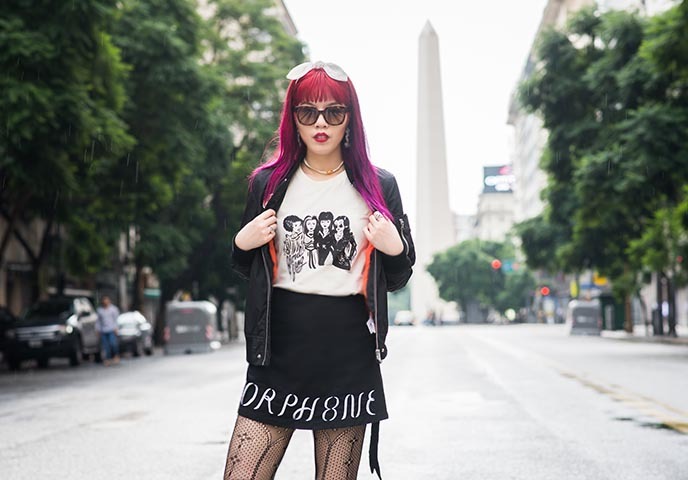 Buenos Aires street style! San Telmo market, La Boca, coolest barrios or neighborhoods. Obelisk, ob-la-da. It’s time for part two of my travels in Buenos Aires, Argentina! The city is divided into 48 barrios, or neighborhoods — each with its own vibe. Of course, we concentrated on the coolest and most creative areas, as you saw in my first post about Palermo and Recoleta cemetery. This time, we’ll sight-see in San Telmo, Puerto Madero and La Boca. The Argentinian capital city has a retro feel to it, in part to the colonial architecture and spirit of Eva Peron. Inspired, I put together a classic 1950s meets street style outfit of the day. I’m standing in Puerto Madero, a waterfront area of Buenos Aires that has undergone recent development. There are pristine gardens and sleek, modern buildings overlooking the water. All of Puerto Madero’s streets are named after women, and the Puente de la Mujer (Women’s Bridge) is designed by neofuturist “starchitect” Santiago Calatrava. 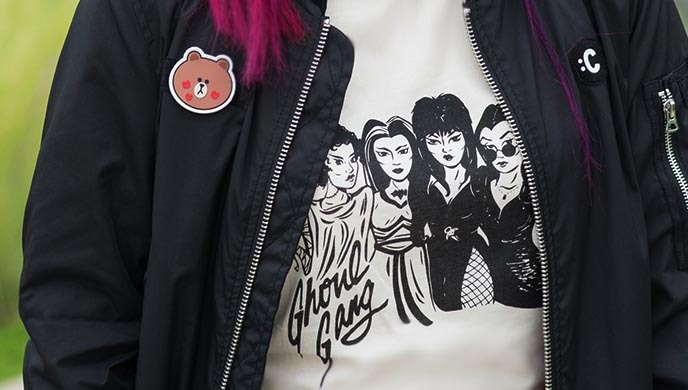 Close-up on my Ghoul Gang t-shirt from Unique Vintage. Hail the original queens of Halloween: the Bride of Frankenstein, Lily Munster, Elvira, and Morticia Addams! As a fan of classic horror films, this is a Gothic girl gang that I’d join in a heartbeat. Buenos Aires is home to the widest street in the world, 9 de Julio Avenue. It’s over 300 feet wide, and named after Argentina’s Independence Day (in 1816). This Egyptian-style monument, “Obelisco de Buenos Aires,” is the symbol of Buenos Aires. The obelisk is located in the Plaza de la República, intersected by 9 de Julio. It was quite the challenge to run into the wide street and vogue for photos before the traffic lights changed… but worth it, for these shots! Detail shots. I’m wearing silver rings by the “Goth-father,” Alex Streeter. My nail art is by Glam Nail Studio; there are close-ups on the designs in this Easter Island post. Argentina is of course famous for its beef. Instead of the crowded traditional steakhouses, I went to La Carniceria in Palermo. This cozy, hip restaurant takes reservations for two dinner seatings, and has a hidden glass panel door for a members-only feel. I enjoyed sitting at the bar and watching the chefs stoke the fires, while sipping on a refreshing gin and tonic flavored with fresh huacatay (Peruvian black mint). 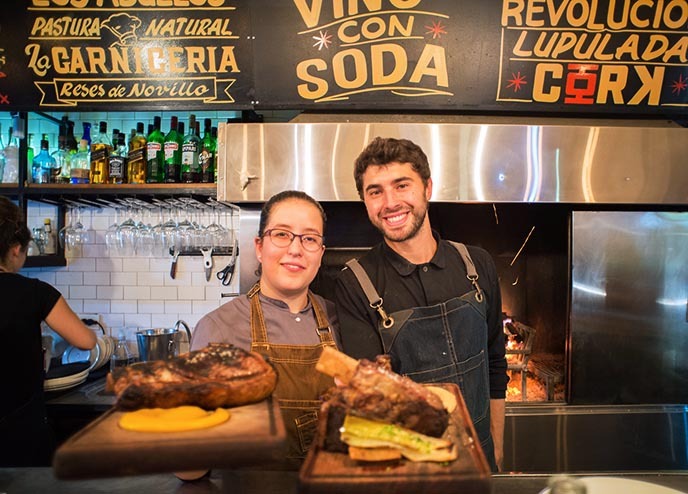 La Carnicería’s owners Pedro Peña and Germán Sitz put a modern spin on traditional steakhouse dishes. We whetted our appetites with a warm, smoked provolone cheese. One of their specialities, sweetbreads, were a delightful surprise: caramelized and on top of cornbread. A glass of malbec (Argentine red wine) was the perfect accompaniment. The main event were these generous, fire-grilled cuts of grass fed beef. The steaks had wonderful smoky flavors, and came with chimichuri dip. At La Carniceria, the creations change depending on what’s fresh and available. Small, ripe plums with cream made up the perfect seasonal dessert. A delightful meal, from start to finish. 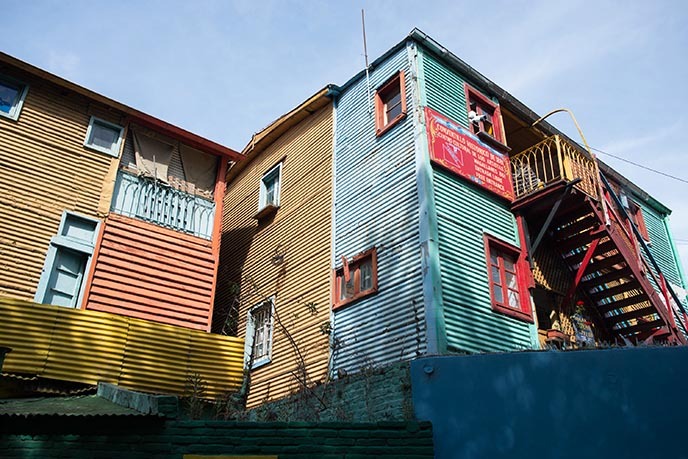 On another day, we explored the colorful district of La Boca. As you can see from this mural, the 90s are forever here. 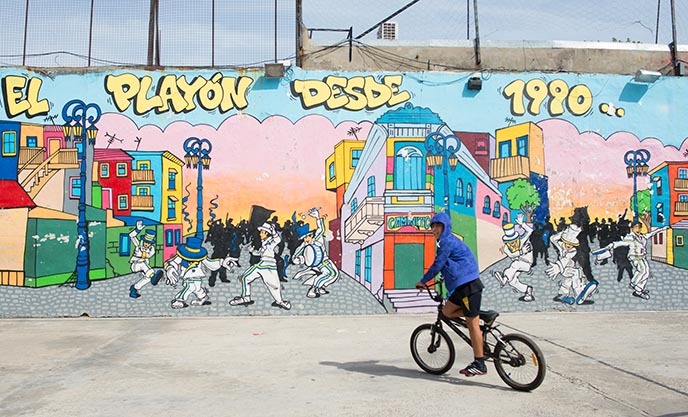 La Boca is a working class barrio (neighborhood) that has been brightened by street artists. 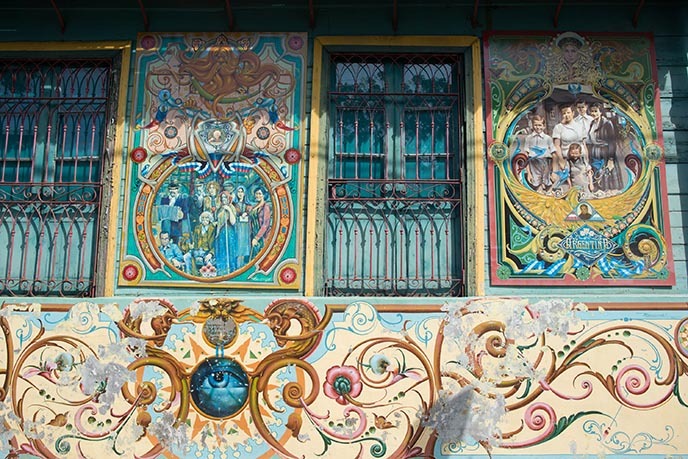 The main alley, Caminito, is surrounded by rainbow-painted zinc houses, theaters, tango dancers, and walls of art. 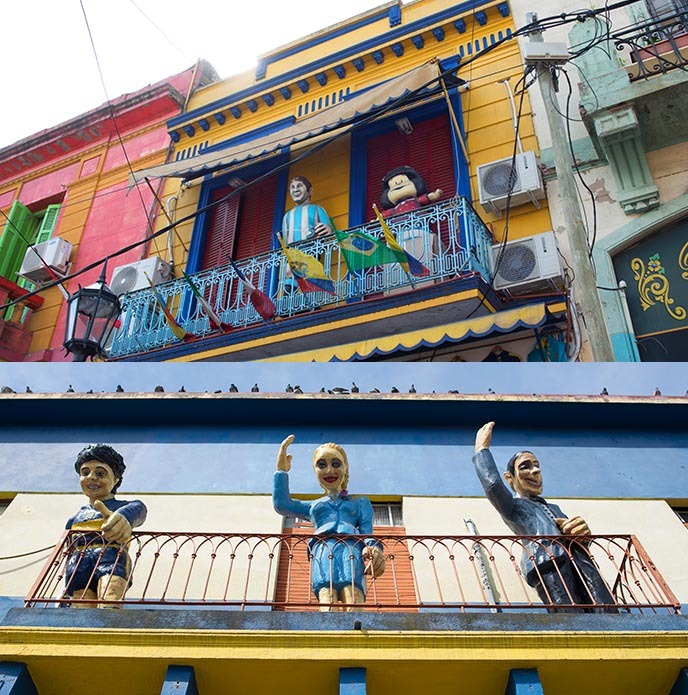 La Boca’s Caminito was originally developed by a local artist, Benito Quinquela Martín. In 1960, he painted the dilapidated buildings and set up a performance space, which turned these cobblestone streets into an art hub. Today, you’ll find plenty of studios amidst these colorful structures. Parts of La Boca feel rather touristy, with lots of gift shops. 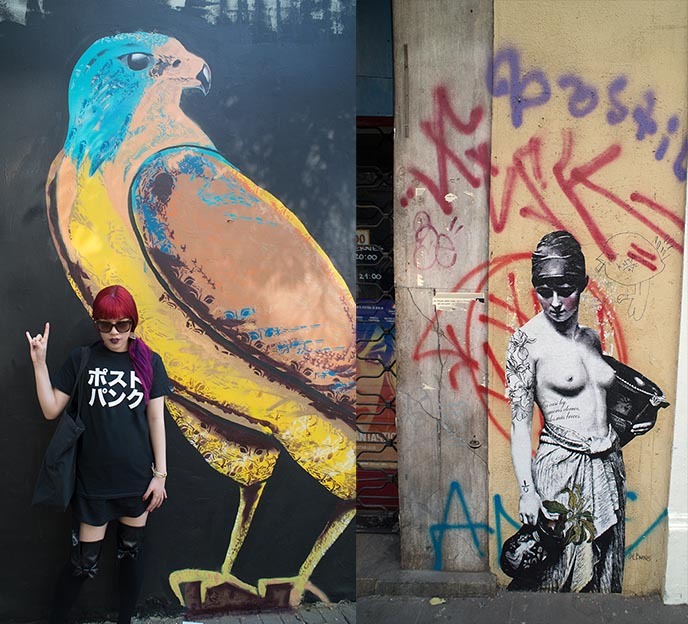 However, if you wander the side streets and railroad area, you’ll find uncrowded alleys with striking artwork. Travellers come to see these corrugated-iron shanty houses, which used to house immigrants. The rainbow paint gives them a modern feeling. 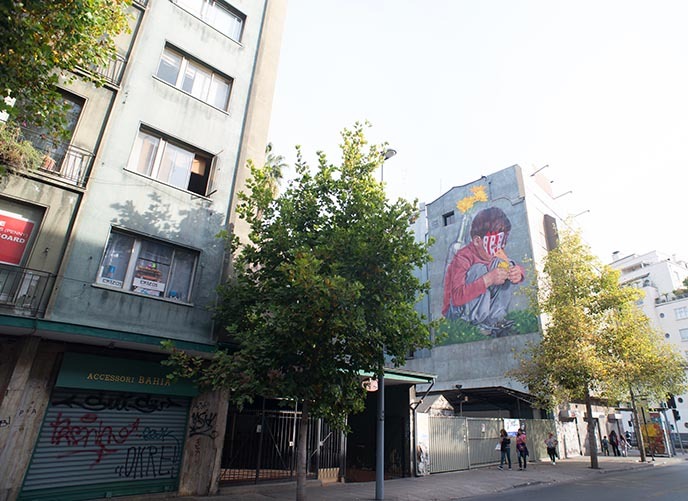 If you’re interested in Buenos Aires street art, I recommend that you also walk around the hipster district Palermo (see this post for info). 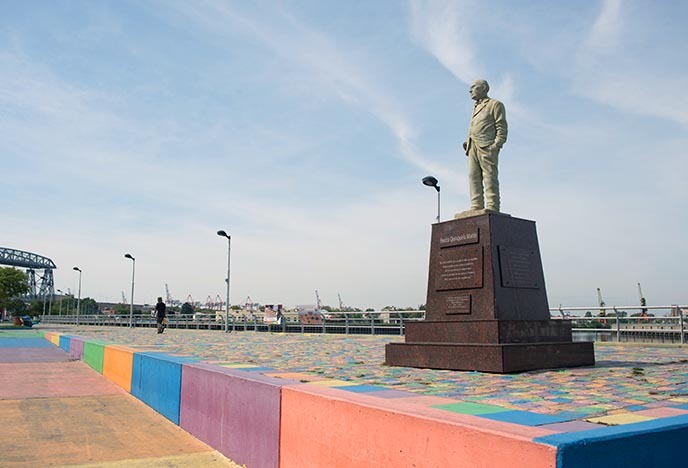 Before leaving La Boca, take a moment to see the multicolored walkway by Riachuelo River. Buenos Aires is a great city for exploring by foot. 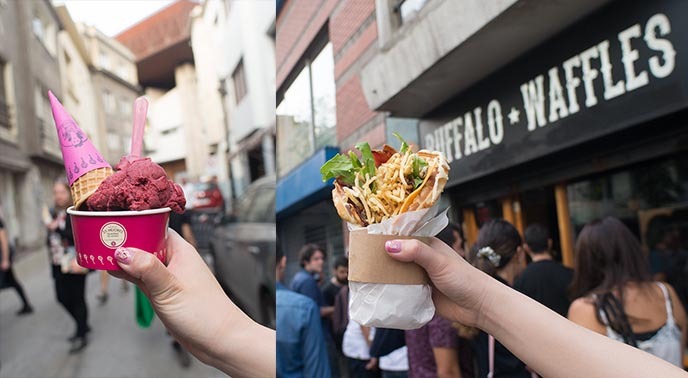 Finally, you can’t miss San Telmo market. 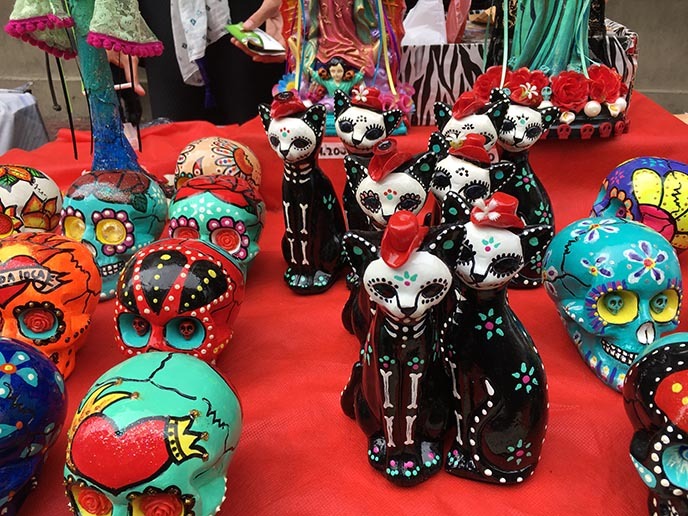 Every Sunday, this barrio transforms into a vivacious street fair with over 250 stalls. 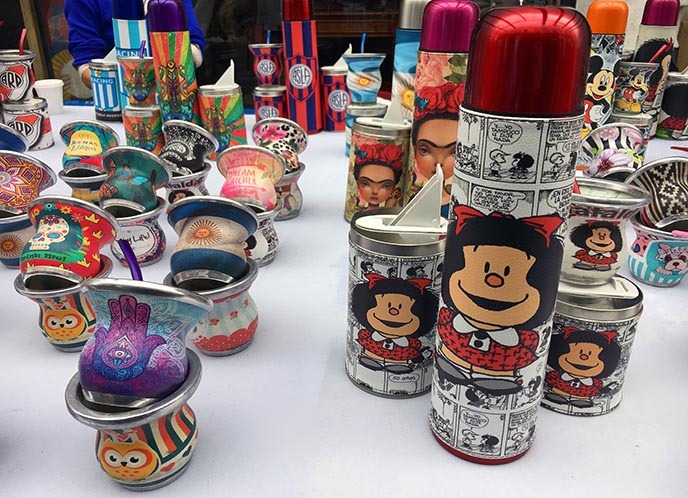 The weekend bazaar is one of the best places to find antiques, local goods, handmade jewelry — and of course, cute memorabilia featuring Mafalda. San Telmo also has a permanent market area that you can visit any day of the week, which mainly sells food. San Telmo’s open-air market spans many streets. 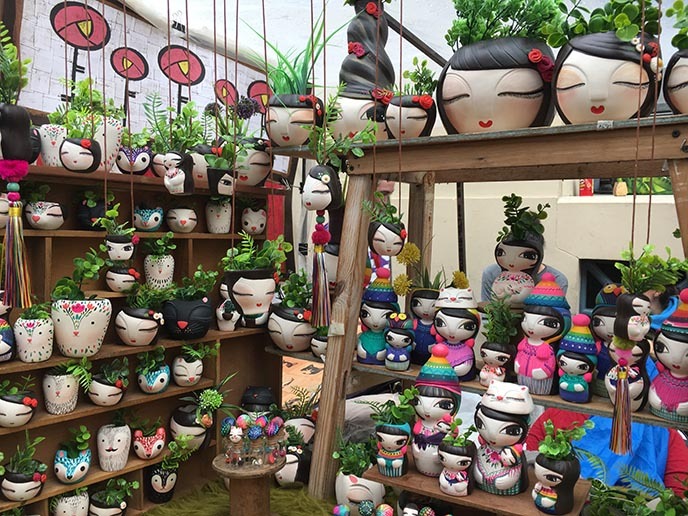 I saw crafts made from cassette tapes, sugar skull cat statues, wind-up toys, coffee stalls… you name it. The market is a great place to snack on Argentinian food. I ate warm empanadas, and tried local-style pizza (it’s uniquely gooey and delicious in Buenos Aires). 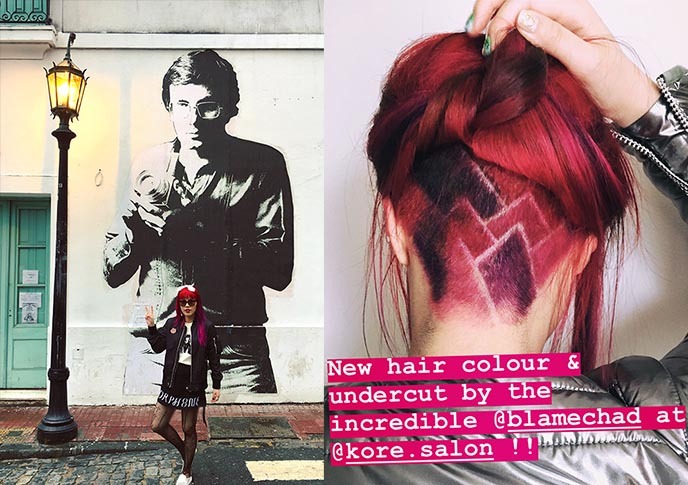 My hair color and undercut are by Chad Mitchell Evans at Kore Salon Vancouver. I hope you enjoyed my travel guide to Buenos Aires’ hippest attractions. (If you missed Part 1 of my Argentina adventures, see the post here). What’s coming up next? I’m heading to two familiar countries in Asia, as well as a new destination. All shall be revealed soon! Sailor Moon ring from Sapphire Studios & tattoo stickers! 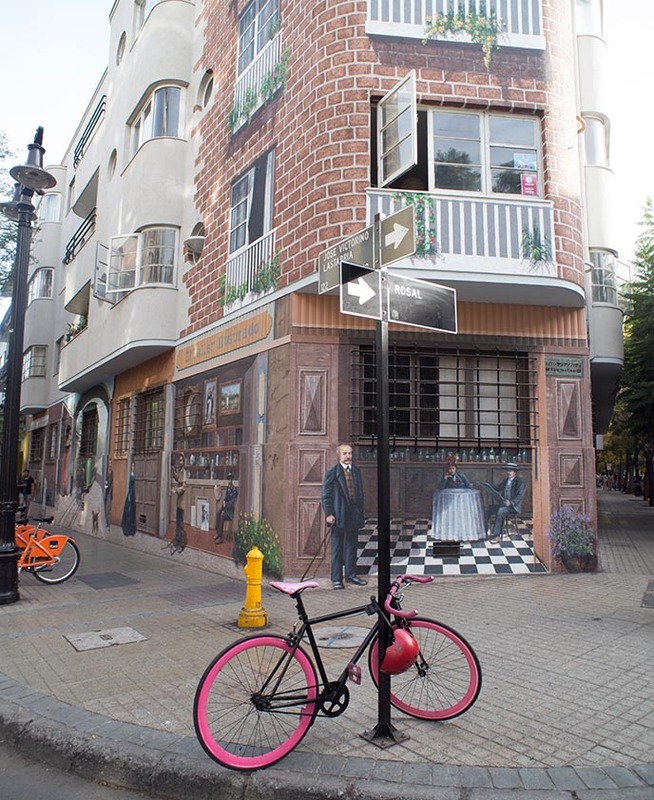 Santiago hipster district Lastarria, De Patio restaurant. “Moon Crystal Power, Make Up!” As a Sailor Moon fan since the 1990s, I’m delighted with my new Sapphire Studios Prism ring — from their Sailor Moon jewelry collection! Read on for three summer outfits featuring my current favorite designers. 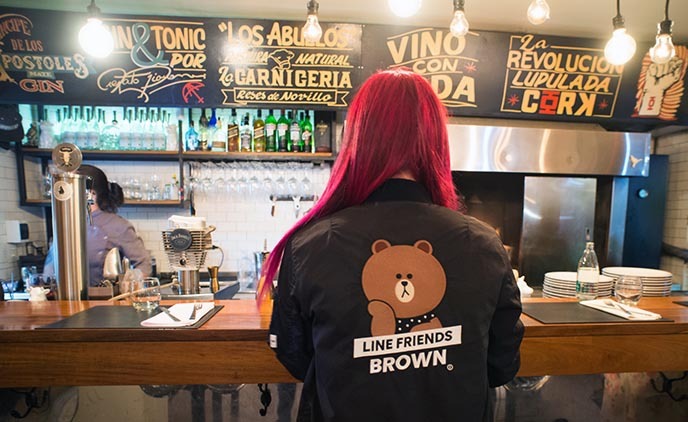 We’ll also explore the coolest restaurant and neighborhood in Santiago, Chile, where I recently spent a few days. Inspired by this universe, Sapphire Studios released a luxurious Sailor Moon jewelry collection. 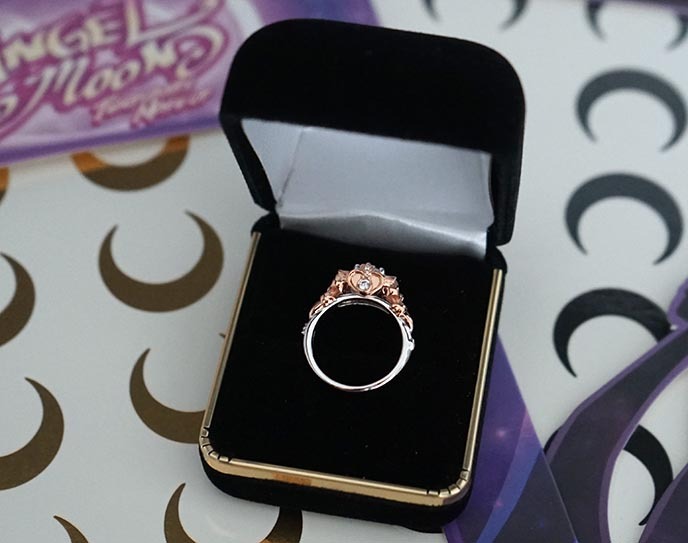 The designs include a crescent-shaped floral necklace, and this Prism ring based on the “moon crisis” heart compact in the series. 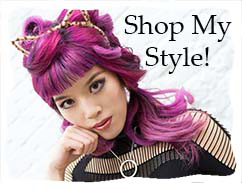 Based in Melbourne, Australia, Sapphire Studios Design produces fine jewelry for those who love alternative, vintage, Goth and Japanese influences (much like myself). Everything is individually crafted with exquisite crystals and gemstones — these are accessories to treasure, and the quality shines through. I loved unboxing my Prism ring, which came in this elegant case and velvet ring holder. As you can see, this isn’t “cosplay” or “costume” jewelry. 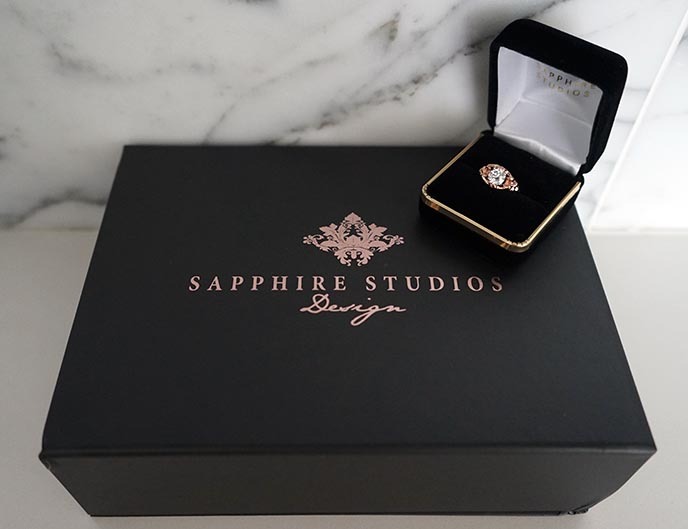 Sapphire Studios makes high-end works of art, which extends to the package presentation. 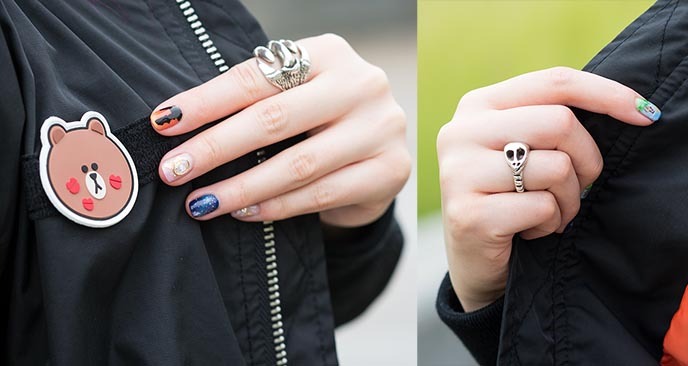 The Sailor Moon ring is a fabulous statement, yet comfortable and subtle enough to wear daily, with all types of outfits. In tribute to Usagi / Serena, I put my hair in “odango” buns, and wore a crescent moon temporary tattoo from Capumon (more about them below). My dress is Liz Lisa x My Melody; it’s currently for sale on my Depop shop. My cut-out lace black capelet is by Pheren Couture, creator of dark and decadent luxury accessories. 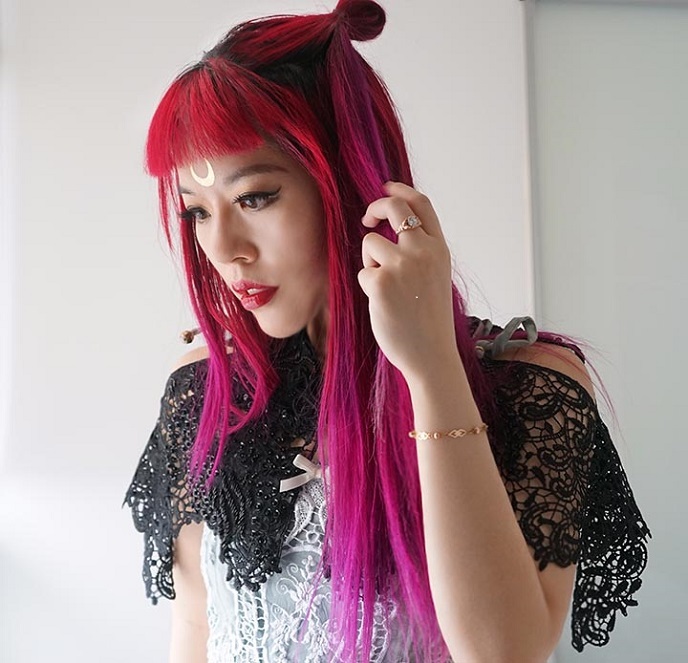 Pheren makes earrings, chokers and other hand-sewn fashion with inspirations from fantasy, history, and Gothic aesthetics. In love with how the material drapes and shimmers, featuring a high collar and wings over the shoulders. 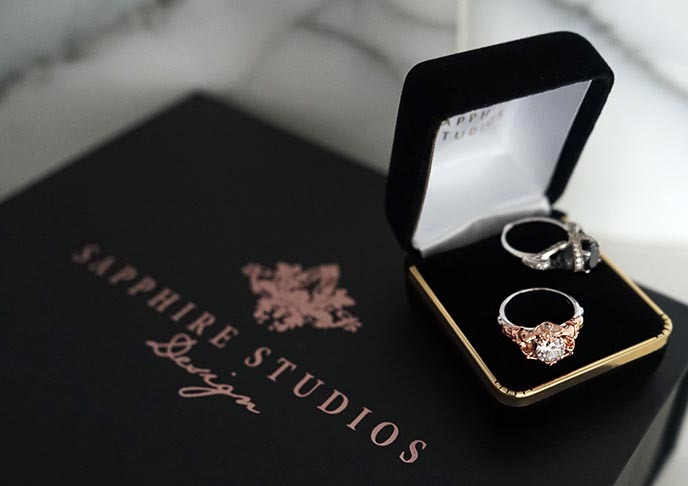 Sapphire Studios even lets you design your own ring, or customize one according to your preferences and budget. Each is made to order, in the size and specifications that you choose. 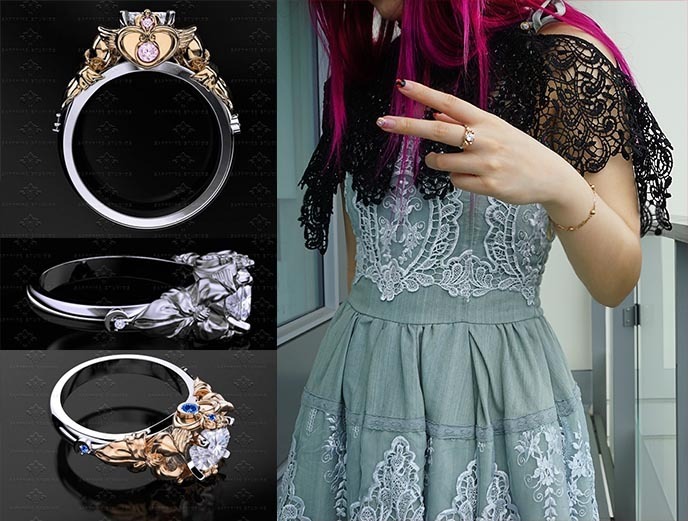 My Sailor Moon ring, for example, can be made with a rose gold, silver or yellow gold band, and with various diamonds or accent stones (opal, blue topaz, pink sapphire). The level of detail is wonderful, as you can see from the crescent moon and ribbon design on the sides. “In the name of the moon,” I encourage you to see more from Sapphire Studios. 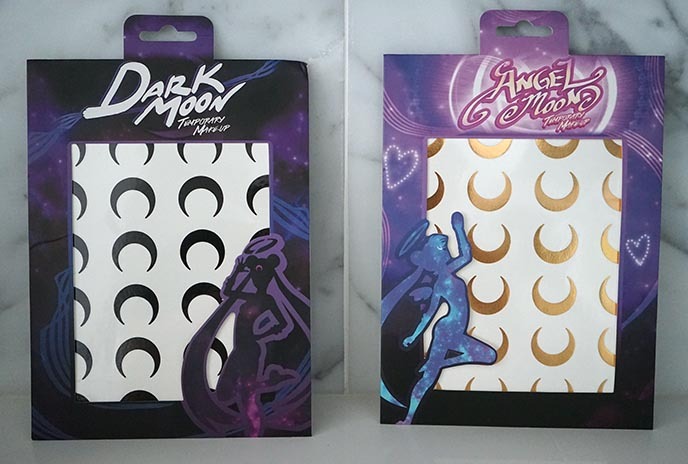 I’m sure you are curious about my Sailor Moon forehead decal… These are temporary tattoos by Capumon! Take “a trip to Nemesis” and wear the Black Moon Clan’s symbol (the upside-down one). 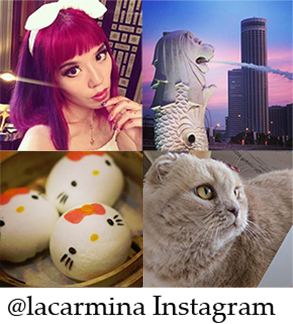 Or choose Crystal Tokyo, and join the squad with a golden shimmering crescent. These Sailor Moon tattoo stickers are a must-have for any fan. Each package contains 56 moons — perfect to share with friends. It’s easy to put on the tattoos: just cut out the 1 x 1 moon, remove the plastic back, and press it to your skin for 15-30 seconds with a warm, damp towel. 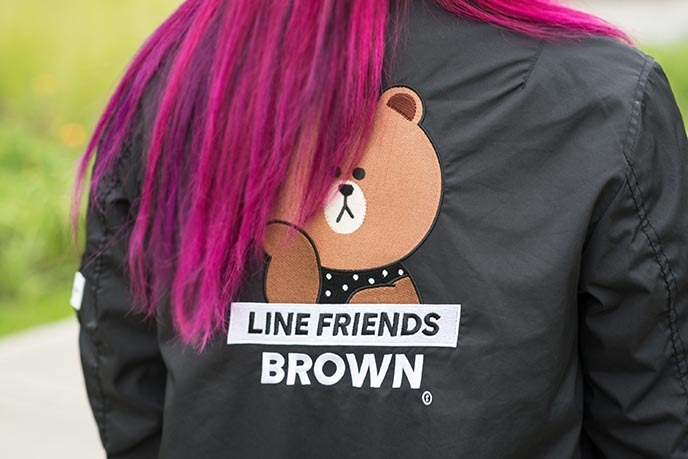 I’ll be wearing these all the time, thanks to Capumon — be sure to check them out, and they ship orders worldwide. And now, another summertime outfit. Popular in the 1990s, slip dresses are perfect for warm weather days. 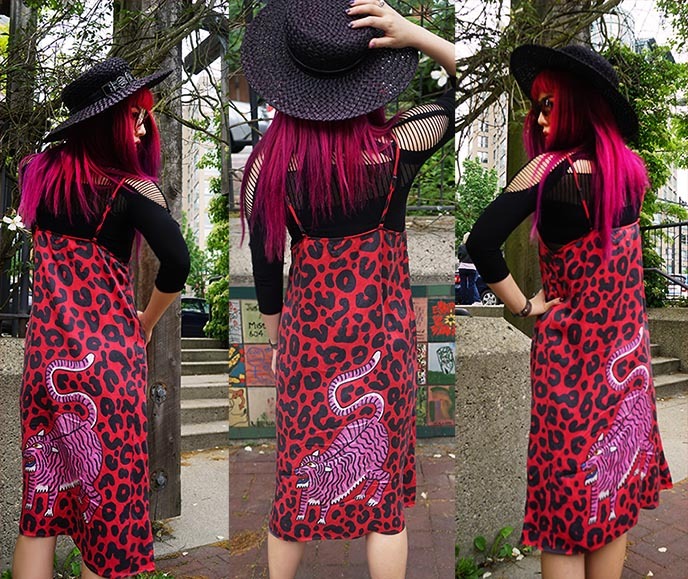 This red silk slip dress is by Print All Over Me, designed by gentlethrills — how about that roaring jaguar and animal print pattern! 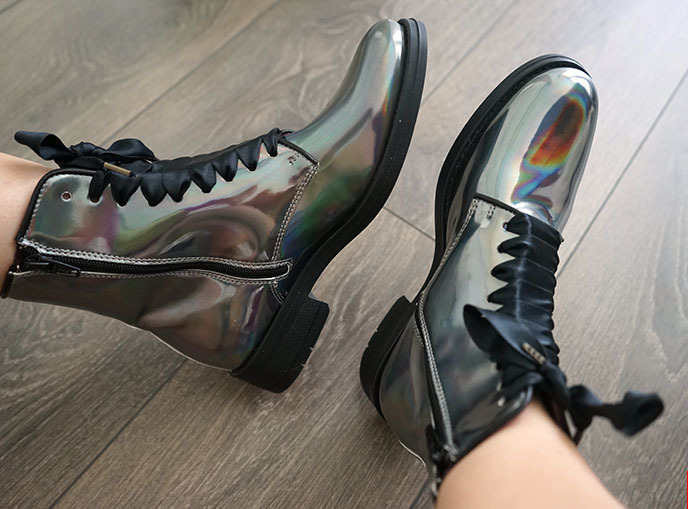 I’m all about holographic space-age materials, and can’t get enough of these Irregular Choice boots. Love the reflective silver leather, with black ribbon laces and a zipper up the sides. 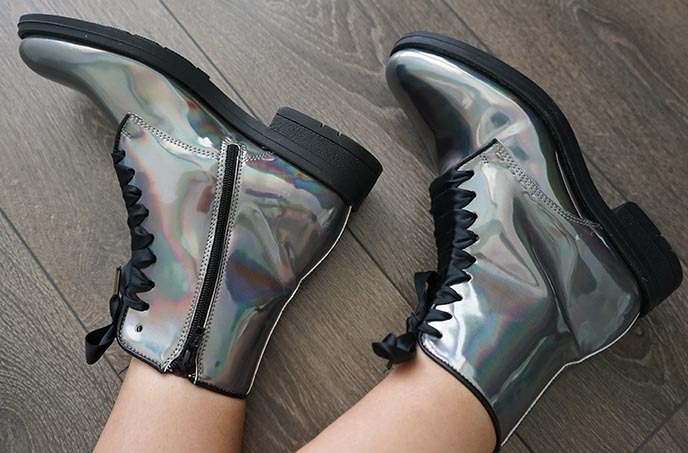 I think these ankle boots are made for walking on the moon. Another look at my Print All Over Me spaghetti straps dress. As you can see, the lightweight silk flows, and the original print appears on both sides. Photos of Outfit #2 by my first mate Naomi Rubin, who is currently releasing a weekly comic, Moonsprout Station. It’s “a queer fantasy comic about growing community and relationships while exploring and studying a world full of islands floating in the sky,” rendered in compelling watercolors and linework. I reunited with her at the VanCAF (Vancouver Comic Arts Festival). 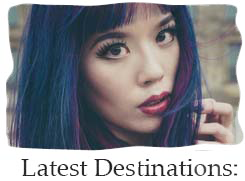 We have more Pirate adventures coming soon in Asia… stay tuned to see what we’re up to next. 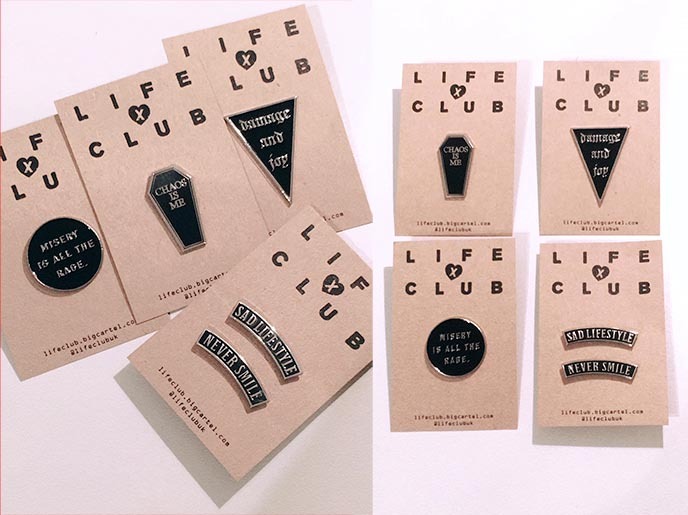 Close-up on my Gothic enamel pins, from Life Club. 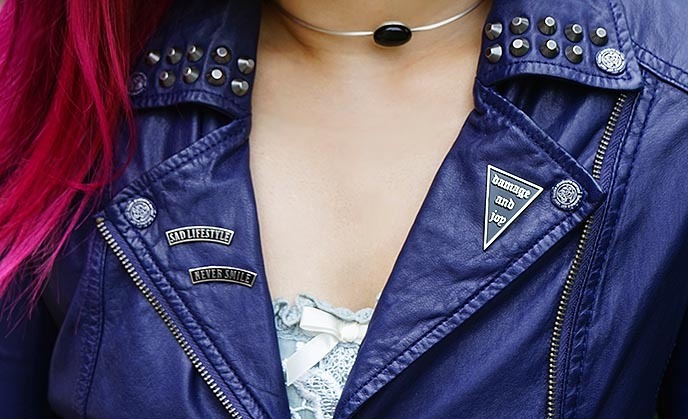 These accessories are the perfect way to decorate a leather jacket (or any item of clothing), and the mottos speak to my inner emo kid. Damage and Joy, Sad Lifestyle, Never Smile… you got that right. Chaos is Me (in the shape of a coffin). Misery is All the Rage. It’s safe to say that UK-based Life Club rocks! These enamel pins come in gold or silver edging, and they have tons of designs with rock, metal and Goth themes / words / shapes. Outfit #3 brings us to Santiago, Chile. My black-white-red color scheme matched well with my chic Wimdu apartment rental. I enjoyed staying in a local’s area of Santiago, right across from Ecuador subway station and surrounded by grocery stores (I picked up sardines and avocados, of course). It was easy to book this flat using Wimdu’s site, and communicate with the kind host Beatriz. Plus, the WiFi and all amenities were included for a far lower rate than if we had gotten a hotel. I didn’t have too much time to spend in the Chilean capital, so I headed straight to Barrio Lastarria. As you can see, it’s known as the youth / hipster / art district of Santiago. This is a great neighborhood for strolling and people-watching, and there’s plenty to do here (street food, bars, theaters, art installations). Attack of the lobster-aliens! La Starria is a colorful area with unexpected murals, and small markets where locals sell organic and handmade products. 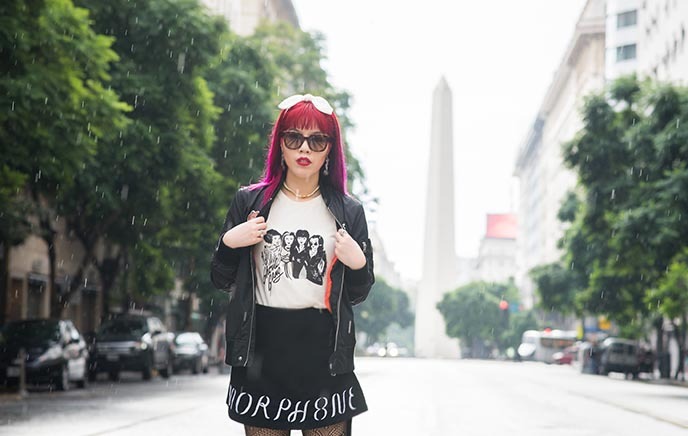 – My Japanese top is by Underground England (if you can read katakana, you’ll know that it says Post Punk). – My Girardi Meredith hold-up knee socks are from UK Tights. Just like Anthony Bourdain (RIP), I’m all about finding cheap and local eats wherever I go. LaStarria is full of tasty and creative food, for a handful of Chilean pesos. Locals adore the gelato from Emporio La Rosa (I got scoops of berry and dark chocolate). I also tried the new Buffalo Waffles, a genius waffle wrap with cheddar and vegetables inside. 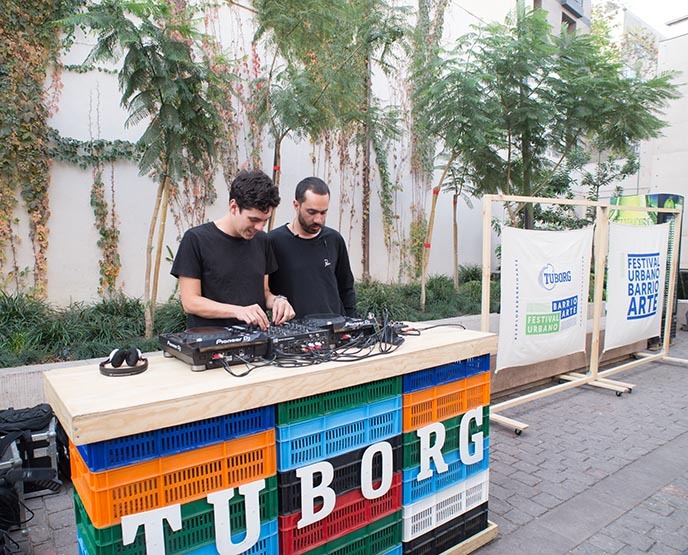 Especially on weekends, you’ll hear music wherever you walk in Barrio LaStarria. We came across flamboyant dancers in the streets, a slightly annoying clown-mime, and these electronic DJs at an outdoor public lounge. What else is there to do in LaStarria? 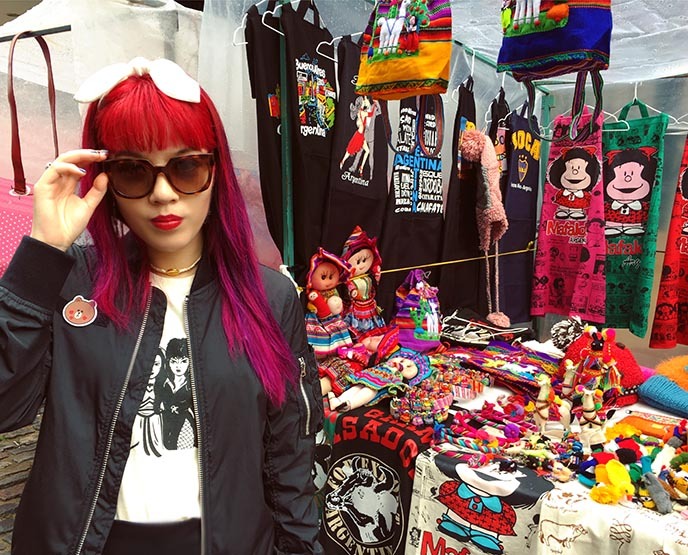 Browse the alternative boutiques, which sell kawaii cute and rock / Goth fashion. And enjoy the urban art all around. In addition to these giant wall paintings, I encountered a moving lights installation that anyone could enter for free. I was pleasantly surprised by the hip artwork I found in Santiago. 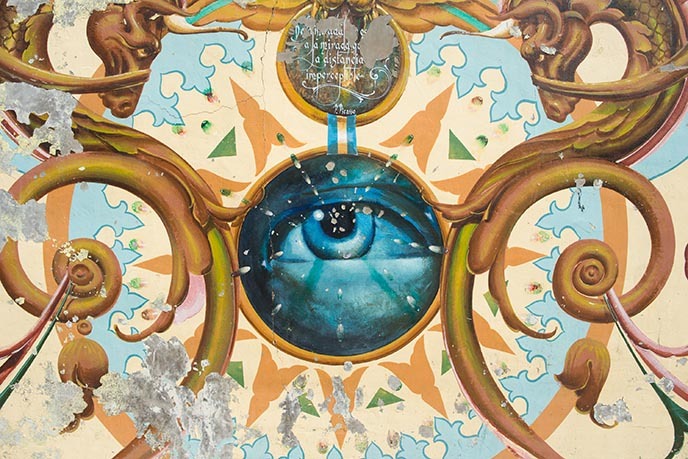 You may recall that I also went to the vibrant street art city of Valparaiso. The takeaway: Chile is one cool country. We wrapped up our Santiago trip with the most creative meal I’ve had in a long time. I heard rave reviews about a young restaurant, De Patio, and was keen to experience it for myself. It took a while to locate the hidden entrance (barely-marked large wooden doors), which opened up to a spacious, modern interior with a courtyard. We sat the bar counter in front of the open kitchen, and watched Chef Benjamin Nast work his magic. 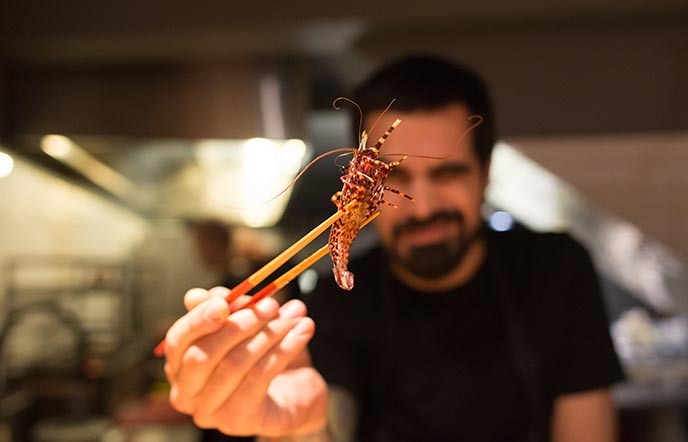 Chef Benjamin Nast has an impressive resume — he worked in top restaurants in Chile, Paris, and Barcelona (at the Michelin-starred Dos Palillos owned by Albert Raurich, the former executive chef El Bulli). 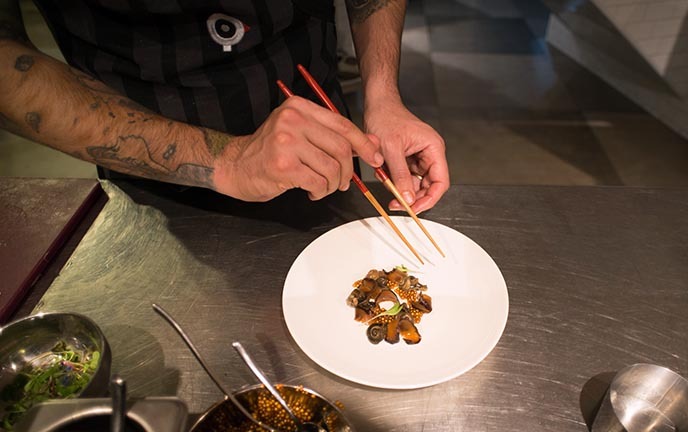 In 2017, he opened up De Patio in Vitacura, to highlight Chilean products along with Asian flavors and techniques. Sit at the counter, and let him surprise you with an 8 or 12 course menu. Everything he creates is daring and artistic; delicious without being pretentious. 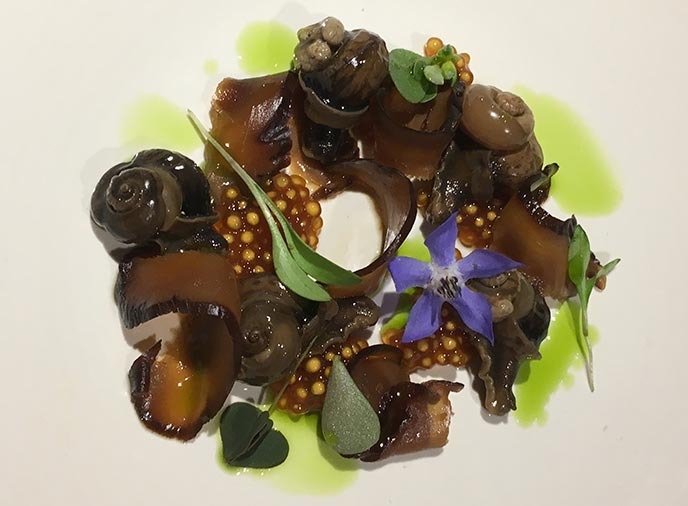 Our first taste was an eye-opener: snails from the garden with soy shitake mushrooms, tapioca, and flowers. 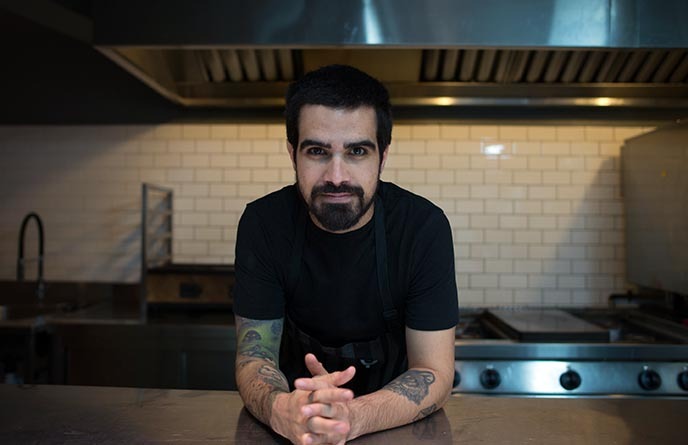 We enjoyed chatting with the tattooed Chef Benjamin. 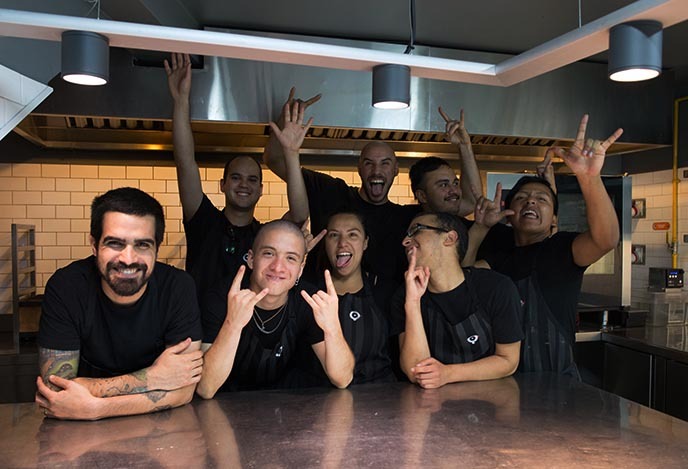 He explained that De Patio Restaurante’s circular logo is inspired by Woody Woodpecker, “the crazy bird” — and spoke passionately about how the team experiments to make surprising dishes from seasonal ingredients. It was a treat to watch Chef Benjamin prepare each plate in front of us, while The Doors and Janis Joplin howled from the speakers. Between plates, I sipped on the perfect healing drink made just for me: a pisco sour with eucalyptus, honey, ginger and lemon. 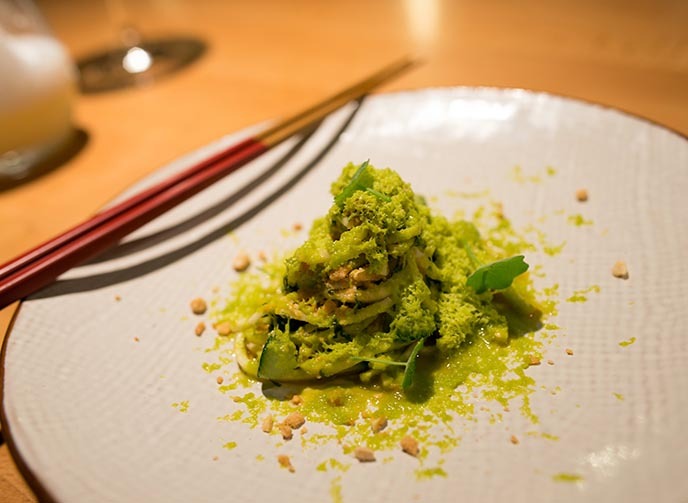 Above: zucchini noodles, clam, picked cucumber, almonds and grated avocado — wow. He showcased his finesse for Japanese cooking with a shabu shabu: fresh fish, scallops and still-moving prawns in a delicious dashi broth. Dessert was once again a feast for the eyes and tastebuds. 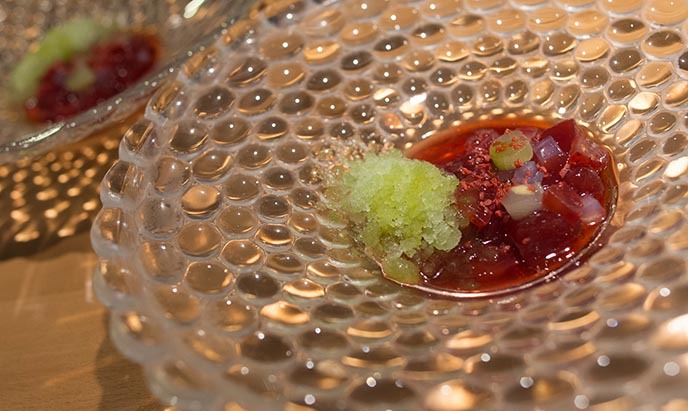 Above is a refreshing cucumber granita and strawberry coulis with freeze-dried vodka jelly. He also served up crispy potato ice cream sandwiches with thyme, whiskey, toffee, egg — we ate them so fast that there aren’t any photos! 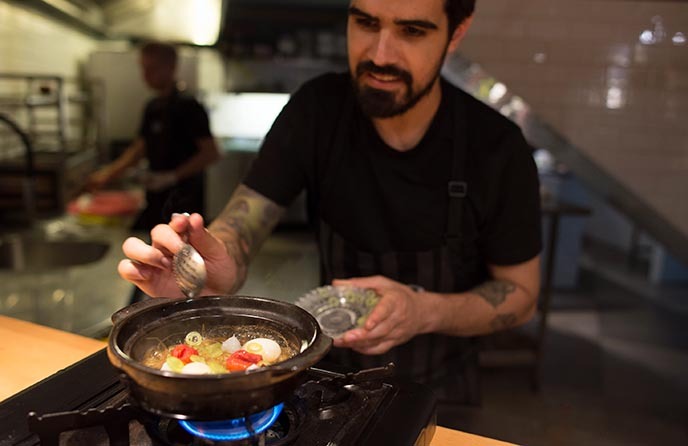 The fun team at De Patio is constantly changing up the menu, and their passion is infectious. 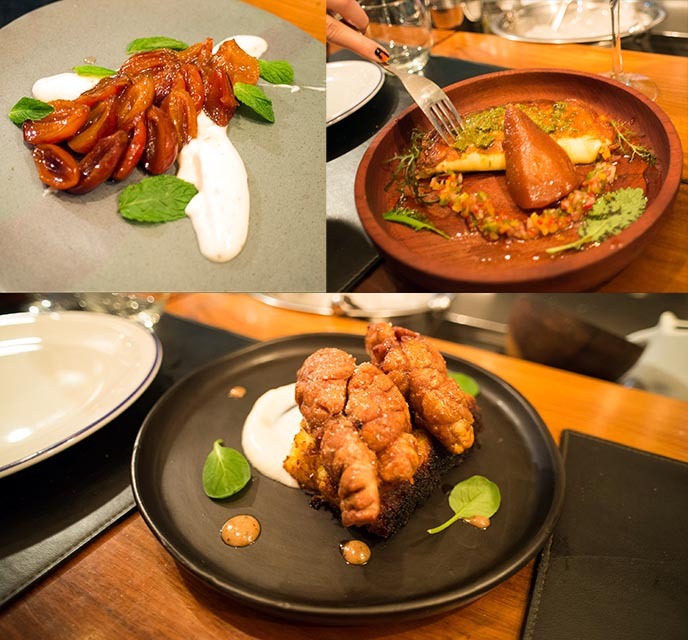 Prices are extremely reasonable, and I’m certain that the restaurant will be racking up more awards — so be sure to go, when you’re in Santiago. 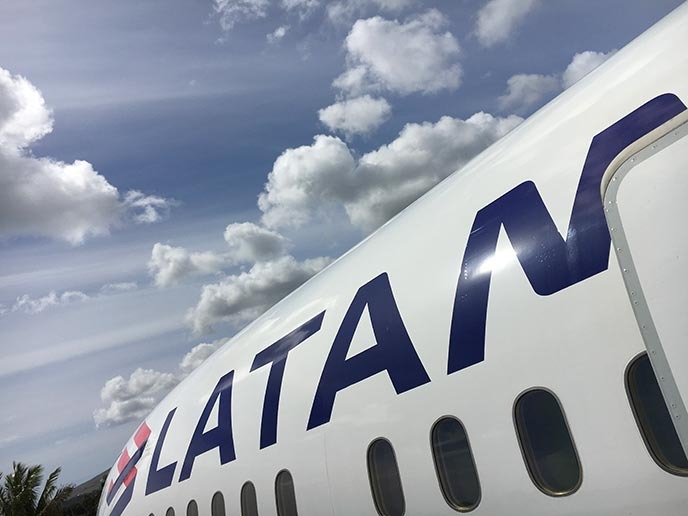 Thanks to LATAM Airlines for letting me bring these “only in South America” stories to you. We still have more from Buenos Aires and Sao Paulo to come, as well as the isle of stone-faced aliens… If you missed the previous posts, come take a look at the S. America category here.